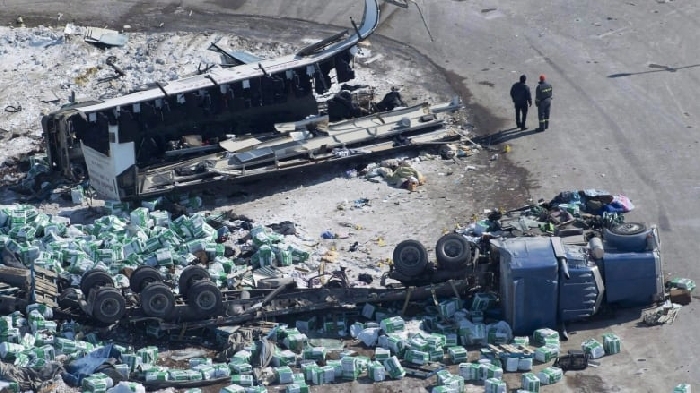 The owner of an Alberta trucking company involved in the fatal Humboldt Broncos bus crash has been charged. "The charges follow an investigation that was completed by Alberta Transportation into the collision," Mason said Wednesday. "The investigation found multiple instances of non-compliance of various transportation regulatory requirements in a six-month period." When reached in Calgary, Singh said he didn't have any comment. Singh's first court appearance is Nov. 9 in Calgary. The maximum penalty for a federal hours of service failing is $5,000 per offence, while the provincial charge carries a $310 penalty. A court can, however, use discretion to impose a penalty up to $2,000. Alberta Transportation said Adesh Deol Trucking remains suspended.